Just in: Memo of Understanding (MOU) signed between American Legion and US Warriors Outdoors. After several months of building relationships with the American Legion in Colorado, the Colorado Legion endorsed USWO today and we signed a mutually beneficial MOU. With an MOU in Colorado, it allows USWO to pursue other state endorsements as well as other strategic opportunities. The American Legion is extremely selective about who they partner with. We are honored, humbled and excited to be included in this list of credible partners. The MOU was signed at the Colorado State annual meeting of Directors. 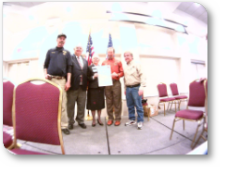 The MOU was crafted and signed by Gene Palumbo Carol Kennedy (Colorado Commander) and Pat Smith (former National Commander) In attendance at the state meeting were several multi state Commanders and former National Commanders. A very impressive group of leaders very excited about our relationship and collaborative programs we'll be launching during 2014. One state director was practically in tears as he expressed thanks for the good things USWO is doing and the great things we can do together moving forward. This is a heart-felt relationship that will evolve over many years and celebrating many successes. Again, a very credible stamp of approval for USWO regarding the great programs we have executed, providing safe and therapeutic programs for veterans and further validation of our mission, hard work and dedication. A special thanks to my team including: Dave Proffit, Bill Dorris, Jennifer Reifman Ryan Meyer, Lori Borst, Danielle Dorris, my son Tucker and wife Heather for volunteering. As well, thank you to my Board members, Bob Coker, Mark Daily, Courtney Stecker, Brandon Sewall and Chuck Stecker for their continued support and direction. Another special thanks to our sponsors Cabela's and Solar City. You are now joined by another very powerful brand, with credible history and dignity. I'd like to personally thank Karl Mecklenberg for his support as well. 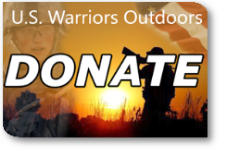 Having Karl involved in one of our wounded veteran hunts certainly adds a stamp of approval to USWO.